A Chinese remote sensingmission, believed to be a military reconnaissance satellite, lifted off from adesert launch pad on a Long March rocket on Wednesday, state media reported. The Long March2D rocket blasted off at 0842 GMT (3:42 a.m. EST), or during the afternoonat the Jiuquan launching base near the border of northern China's InnerMongolia and Gansu provinces. The 135-foot-tall booster'stwo stages, fueled by hydrazine and nitrogen tetroxide, guided the Yaogan 7payload into a sun-synchronous orbit about 400 miles high, according to publictracking data. The state-run Xinhua newsagency reported the satellite will be used for scientific experiments, landresources surveys, crop yield estimates and disaster response applications. But the craft is likely anelectro-optical spy satellite to be operated by the Chinese military. Observersbelieve the Yaogan series, which began launching in 2006, is a new fleet ofhigh-resolution optical and radar reconaissance satellites. The new satellitewould be the third Yaogan spacecraft fitted with an optical imager. 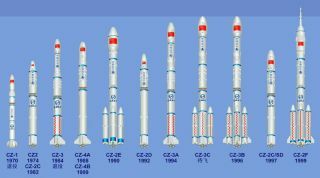 Yaogan 7 was built by theChina Academy of Space Technology under the China Aerospace Science andTechnology Corp., according to Xinhua. Wednesday's launch wasannounced less than a day in advance, typical publicity for Chinese militarylaunches. The flight was the fifthlaunch of a ChineseLong March rocket this year, and the 69th space launch to reach orbitworldwide in 2009.